I find it hard to believe that the last post I did on Florence + The Machine was back in May 2010 with a write up on the "Cosmic Love" video. That's insane! Clearly my blogging has taken a back site to life over the past few months. Case in point? Oh, I don't know. Maybe the fact that I'm just NOW watching the video for Florence + The Machine's new single, "No Light, No Light." Well, I suppose it's fitting that my two Florence posts are on songs that are so similar, at least according to Alix Buscovic from BBC who compared the new single to 2010s "Cosmic Love," the topic of my last Flo post. 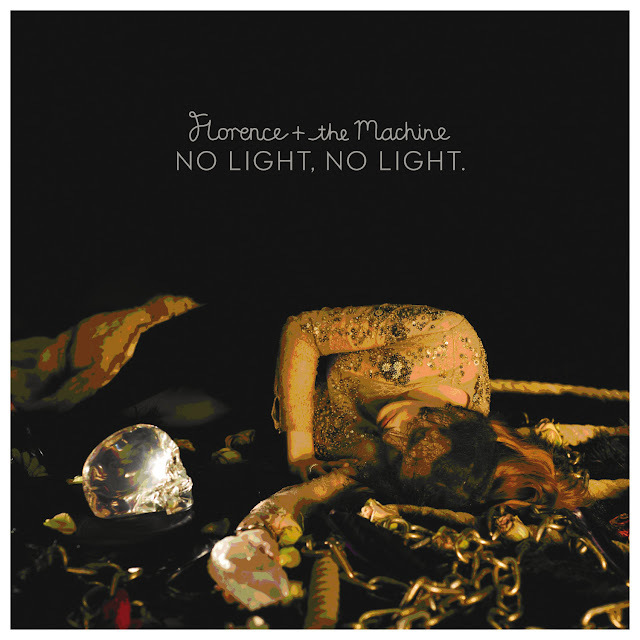 So, without further ado - the stunning Florence + The Machine and her brilliant new single, "No Light, No Light." "No Light, No Light" is Florence + The Machine's second official single, serving as a follow up to the incredibly infectious "Shake It Out" and the hauntingly beautiful "What The Water Gave Me." Recorded at The Abbey Road Studios, the song was written by Florence Welch (the band's front-woman and lead singer) and Isabella "Machine" Summers (singer/songwriter/producers/remixer) with production brought to you by the amazing Paul Epworth (Adele, Cee-Lo, Foster The People). With the way things have been going for Florence's career lately, I'd say she's most certainly on the right track which helps her being able to land mega-hit producers like Epworth. "No Light, No Light" features Florence Welch's trademark, gut-wrenchingly-beautiful vocals, which (of course) sound as pristine as can be. I'm going to go ahead and say it right now. Welch has one of the most unique and interesting voices in music today. Welch's voice has an uncanny ability to transcend genres (the epitome of 'genre-bending') seamlessly shifting from indie rock to Top 40 pop, to hip-hop, even to dance. As an artist, versatility is key, especially the longer you want to stay relevant and from the looks of it, Florence + The Machine is going to stay relevant for quite some years to come if she keeps this up. As even a casual Florence + The Machine fan will attest, Florence Welch has a penchant for drama. Every video and nearly every performance turns into a big production, not just visibly but audibly as well. Partially taking place in a church, the Ami & Kinski (duo from Iceland)-directed music video (below) features a radiantly beautiful Welch running through the streets, being chased by a mysterious-looking young child, and ends with a beautiful, long-lasting dive off the top of some skyscraper. While I'm honestly not sure what the concept is for the video, it's got no shortage of arresting visuals. The first song released off of Ceremonials, Florence + The Machine's sophomore album, was called "What The Water Gave Me" which peaked at #24 over in the UK singles chart and #91 on the Billboard Hot 100. First OFFICIAL single, "Shake It Out" went all the way to #12 on the UK chart, and peaked at #79 on Billboard's Hot 100 chart. Ceremonials was released this past fall, where it debuted at #6 on the Billboard 200 chart. #6 is a pretty good turn out considering how quickly Florence + The Machine rose to the top and made a name for themselves over on this side of the pond. Not easy to do for an import artist, but Florence Welch has got talent for days, not to mention a quirky fashion sense and personality. LOVE. "No Light, No Light" is due for release next Monday, January 16th in the UK so get excited for that. Here in the States, you can buy a 2-track Remix EP for the new single, featuring remixes by DAC and Breakage, so grab that HERE. You also might as well check out "Shake It Out" on iTunes HERE, and make sure you snag yourself a copy of Ceremonials (I just did! ).